Below is the text of a paper I wrote on plagiarism in the first term of my master’s program at the University of Denver and have previously posted on this blog. In the Internet age, it is easier than ever to commit this act. Plagiarism can be a deliberate deception. It can be due to a lack of knowledge about using and crediting sources. We must all guard against it. “Plagiarism is theft.” This blunt definition comes from Susan M. Hubbuch in her book, Writing Research Papers Across the Curriculum.1 Other experts in academic writing invoke images of criminal behavior. Cheryl Glenn and Loretta Gray equate plagiarism with the piracy of films, videos, music and software.2 The message is clear: plagiarism is a major wrong. Plagiarism is the act of representing another author’s work as one’s own. Text, data and images can all be plagiarized. This misuse of content can be overt and deliberate, or it can be subtle and unintended. A writer who respects academic integrity protocols (such as those posted on University of Denver Web sites) and who makes sincere efforts to express the work and observations of others in reconfigured language can still commit plagiarism. 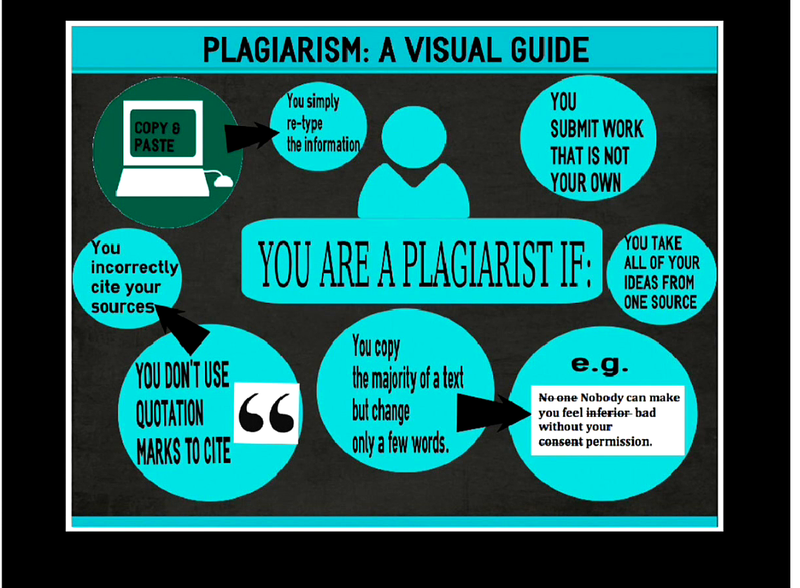 Plagiarism is a serious issue due to the two fundamental failures it comprises. First, it is unlawful use of intellectual property. As Hubbach, Glenn and Gray assert, this is the same legal and ethical breach seen in other forms of stealing with ignorance (unintentional plagiarism), offering no defense. Second, plagiarism invalidates the student writer’s academic exercise. An intentional plagiarist cheats outright. An unintentional plagiarist does not delineate his or her original thinking, the ultimate goal of any writing assignment. Plagiarism has never been so easily committed, thanks to today’s technology which provides the tools to access and manipulate a literal world of text, data and imagery. Countering this, plagiarism has never been so easily detected, thanks again to technology including systems such as Turnitin.6 Despite these policing mechanisms, the simplicity of appropriating others’ work remains compelling and insidious, creating a copy-and-paste canon—inauthentic, unsanctioned but undeniably prevalent. A thorough understanding of plagiarism will protect the intellectual and artistic achievements of others and preserve the academic integrity of students. 1. Susan M. Hubbach, Writing Research Papers Across the Curriculum (Boston: Wadsworth, Cengage Learning, 2005), 170. 2. Cheryl Glenn and Loretta Gray, The Hodges Harbrace Handbook, 17th Edition (Boston: Wadsworth, Cengage Learning, 2010), 561. 3. Susan M. Hubbach, Writing Research Papers Across the Curriculum (Boston: Wadsworth, Cengage Learning, 2005), 172. 4. Susan M. Hubbach, Writing Research Papers Across the Curriculum (Boston: Wadsworth, Cengage Learning, 2005), 174. 5. Susan M. Hubbach, Writing Research Papers Across the Curriculum (Boston: Wadsworth, Cengage Learning, 2005), 181. 6. Cheryl Glenn and Loretta Gray, The Hodges Harbrace Handbook, 17th Edition (Boston: Wadsworth, Cengage Learning, 2010), 561.